Looking for a quiet getaway for the long weekend? Head to Jalpath – all the urban comforts but with rural vibes and tons of.greenery. It even has an attached pond! Ever imagined scenic beauty, bright leafy greenery and a room overlooking a pond just an hour’s drive from the city? Jalpath gives you all that and more. Plan the perfect weekend for your family and friends to have some alone time without the hassle of travelling far out of Kolkata. It’s so lush and green, it’ll give you the illusion of being inside a secret garden. The hotel gives you a homey feel with sloping tiled roofs and carefully designed windows. Unwind and disconnect from the world in their tastefully decorated rooms with low lying traditional furniture, tribal and indigenous décor and rustic crockery. You can even book the entire property, from the outside seating area to the tasteful low-seating dining area, and keep it all to yourselves. There are two rooms up for grabs which you can get at a steal deal of INR 7,000 for the whole property. If you’re only looking for a single room, the daily rent starts at only INR 2,000. They have an attached kitchen if you’re in the mood to whip some culinary treats. They have no TV or WiFi. The idea of having no TV and WiFi terrifies all of us (what if Beyonce drops a new album or we haven’t updated our Insta-stories?!) but Jalpath’s quietness and serenity will let you have some much-need quiet and alone time. 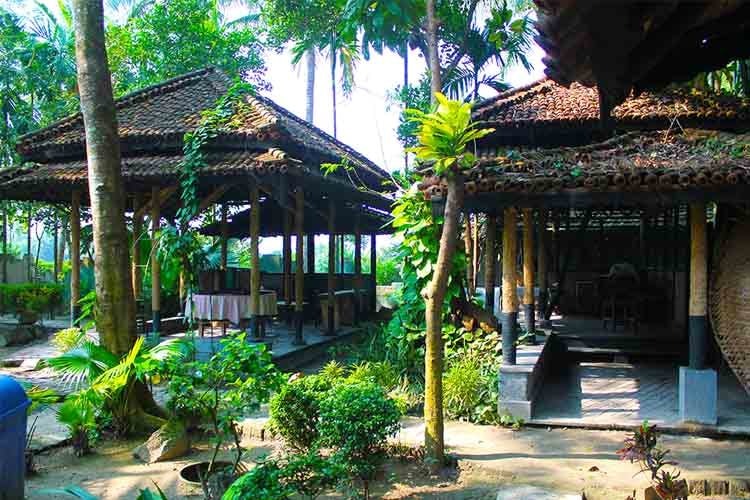 Jalpath is located on the way to Basanti – the gateway to the Sunderbans. It’s easily accessible by road. Drive on Basanti highway from Science City towards Bamanghata, take right from the bridge over a canal before reaching Bamanghata.